My naming agency is highly specialized and focused on medium to large naming projects. And it is very personal. The guy you see in the initial presentation meeting - he is the person who will take care of your entire project. And that's me, Werner Brandl. Project Manager and Chief Creator. Linguist, state certified translator, and trademark inventor. Shaped by studies at LMU Munich and Reed College Portland/OR. After working for the leading European naming firm Nomen for several years, Werner Brandl founded his own business in 2003. His naming agency is located in Munich, and he develops brand strategies and designs brand names for products and corporations. For the German, the European, and mostly for the global market. Creative services must be executed according to verifiable and objective criteria. The success and the quality of our work are measurable. This is why we have integrated some strict controlling elements into our successful naming concept: the definition of objectives, the adaptation of goals, and the integration of feedback, to name but a few. Such a structured approach does not only give you fixed-time and on-budget results, but it also guarantees quality. In other words, you get a name that matches your project one hundred percent and contributes to its future success. We are not alone. We have an excellent network of specialized naming agencies, designers and legal partners, with whom we have been working together successfully for many years. Versed patent attorneys and trademark lawyers, covering all issues of international IP and trademark law for my customers. If there is a conflict of interest, another two trusted partner firms from Munich are ready to help. Since its start in 1998, the Catchword team has racked up an impressive record of names and taglines.They are the creators of such names as Starbucks Refreshers, Keysight, Shomi, Fitbit, or Photoshop Elements, among hundreds of others. Our partner for all Chinese affairs. Labbrand have specialized in the adaptation of brand names to Chinese characters and also the creation of idiosyncratic brands for the Chinese market. Naemes is a subsidiary of branding specialist Daesk, located in Paris. Their expert team under the lead of Patrick Piriou with almost 20 years of work experience offers a wide portfolio of innovative branding services. The leading naming agency in the Spanish market. Experienced specialists with access to markets in Middle and South America. Their portfolio also comprises of design, packaging, and brand assessment. Linda Liguori is a truly creative expert and is perfectly connected in the Italian agency scene. Before founding her own business, she worked for the Italian branch of European naming agency Nomen for many years. This agency, led by Mike Dijkstra, has been around for a long time. Globrands tends to an impressive selection of Dutch and international enterprises in all naming related affairs. And, of course, we have an international network of native language experts and brand specialists for name tests and linguistic services. You would like to read more about my philosophy and my attitude? You want to find tons of cases? You want to have fun? 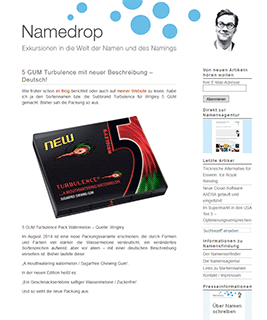 Check out my expert blog „Namedrop - Exkursionen in die Welt der Namen und des Namings“ and take a glimpse into the brains of a naming guy. Unfortunately, only a treat for those with a great command of the Deutsche Sprache.